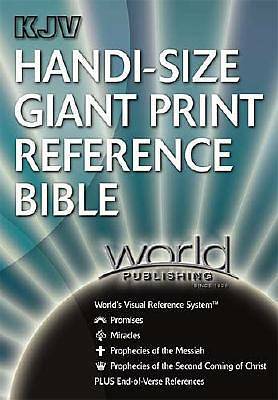 Announcing the newest KJV Handi-Size Giant-Print Bible, and we've added the new World's Visual Reference System (tm). It makes a traditional convenient sized giant-print Bible into an exciting reference tool. The promises and miracles of the Bible plus the messianic prophecies of the first and second advent are indicated with visual symbols throughout the Bible. Brief introductory facts are listed at the beginning of each book. Of course, we are including end-of-verse references to make this the best possible tool. Also, a Dictionary/Concordance is included for finding those hard to remember passages.